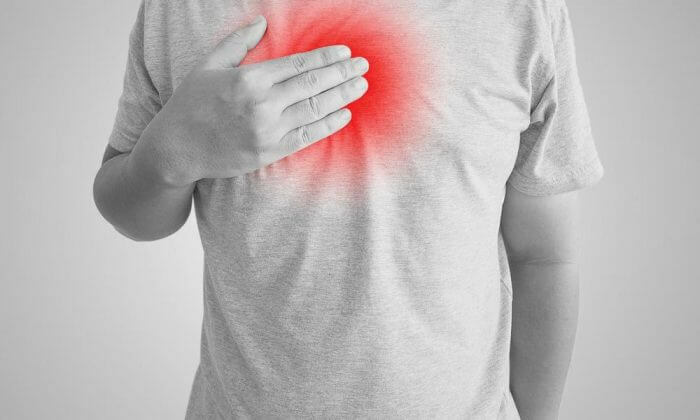 Acid Reflux is a condition when the acidic content of the stomach inside the human body moves upwards into the oesophagus through the lower esophageal sphincter (LES) causing severe heartburn. The lower esophageal sphincter is a ring of muscles between the stomach and the oesophagus that works like a valve in order to prevent the acidic stomach content to move upwards into the oesophagus. But while it leaves a gap frequently, Acid Reflux occurs along with the kind of chest pain called heartburn. This symptom is called Acid Reflux Syndrome and while it occurs more than twice a week, it is defined as Acid Reflux disease and also often termed as gastroesophageal reflux disease (GERD). Heartburn; It is the most common symptom that occurs each time one suffers from Acid Reflux syndrome. A pain or discomfort develops in the chest area along with burping and that may even cause a severe acidic impact in the throat area. Regurgitation: It happens when the acidic food content moves upwards to the throat area and often reaches some amount of it inside the mouth, resulting in a sour or bitter taste or repetitive sour burping. Dysphagia: It occurs when the food you take is stuck in the throat as a result of the narrowing of the oesophagus. Bloating: sometimes bloody or black stools or blood vomiting occurs as the symptom of the disease. Other than these, symptoms like nausea, hiccups, sore throat along with sudden weight loss for unknown reason are other probable symptoms of the disease. It is mainly a lifestyle disorder where the daily schedule and the food habit matters a lot. If you are too much dependent on having untimely fast food or you have to wake for a long night, you will definitely be highly prone to be affected with hyperacidity. If you are prone to too many spicy foods or chocolates or pizza or burgers or an abnormal amount of smoking or consuming alcohol are the major causes of developing hyperacidity. And when hyper acidity occurs frequently, it starts impacting your lower esophageal sphincter which will start leaving a gap between your esophagus and stomach. Subsequently, the acidic content will start flowing upwards through the gap into the oesophagus and often up to the throat area resulting in severe heartburn. It is also found that Acid Reflux syndrome is a very common phenomenon for pregnant women. Statistics reveal that almost more than half of the pregnant women experience Acid Reflux during the period of pregnancy. It is considered to be the combined result of the increased amount of hormone in the body along with the pressure that is generated by the growth of the fetus. Therefore, Acid Reflux in Pregnancy is another important feature of this particular disease. Since the disease is a lifestyle disorder, therefore, the main thing to address the disease lies in the correction of reckless hectic lifestyle. If you have severe Acid Reflux and you feel an urgency to visit a doctor, it is obvious that he will ask about your tension and pressure of life and will advise you to minimize it as much as possible. It is quite important to avoid all junk, fast, oily, fatty and spicy foods along with beverages and cold drinks. You should totally eliminate smoking are having alcohol. Along with that, it is very important to have daily food in a scheduled time. You must avoid sleeping late at night as that can badly trigger the problem of hyperacidity. Along with Lifestyle correction, your doctor will also prescribe some basic medicines in the initial stage. You may be prescribed some basic antacids, the H2 blockers like Ranitidine or Proton pump inhibitors like Prilosec, Prevacid, Protonix, Aciphex etc.